This post was created in partnership with Quaker. All thoughts and opinions are my own. 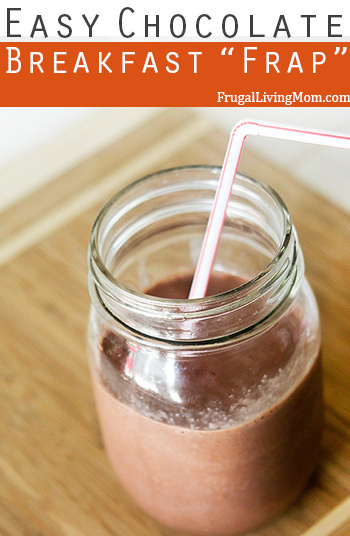 Are you a busy mom who just needs to get yourself and your family out the door in the morning? Sometimes moms don’t have time to get breakfast on the table. This is were Quaker Breakfast Shakes come in. Quaker Breakfast Shakes are available in chocolate, strawberry, and vanilla. They contain 10g of protein, 8g of whole grains, 6g of fiber, and only have 200 calories each- perfect for mom AND kids. The shakes taste a lot like a thicker flavored milk and would be perfect on the go. If you have a bit of extra time you might want to make an Easy Chocolate Breakfast “Frap” with your Quaker Breakfast Shake. It’s a cool treat you can still take on the run if like and you won’t have to stop at your local coffee shop for a morning drink. SCORE!! If you like you can drink it as a chocolate frap or add in a little espresso powder to take care of breakfast and coffee all at the same time! Even better, you can grab a $2 off coupon for your favorite flavor of Quaker Breakfast Shakes. Breakfast in a flash and you save some money, what’s better than that? Pour 1/2 of 1 bottle of Chocolate Quaker Breakfast Shake into ice cube trays and freeze until solid (you can do this the night before). Combine the Chocolate Quaker Breakfast Shake ice cubes with the remaining liquid shake and optional espresso powder in your blender. Usually by making a really quick breakfast like cereal for my kids and I'll grab a cup of coffee and something to eat in the car. Being disabled and never being on the go, this question wouldn't apply to me. I try to handle my busy mornings by pre-packing everyone's lunches the night before so there is less stress in the morning. I try to prepare stuff the night before so mornings aren't so crazy! cereal for everybody then out hte dfoor got to go!!! I'm up around 2 am daily, so breakfast on the go has to be quick and easy, usually a diet shake with a banana . I lay out my clothes for the next day the night prior and make my lunch also. I pack a breakfast for on the go such as yogurt. yogurt and/or a granola bar and/or a piece or two of fruit is my go to quick bfast:) it's just me that I have to feed as of now- and the nursling, but that's never really on the go! I make sure I have breakfast food for the whole week ready to go on Sunday afternoon! I usually grab a piece of fruit and I'm out the door as far as breakfast is concerned. Make lunches and layout clothes the night before. Usually have cereal and toast on school days. Make sure to have your clothes ready the night before . I also plan the night before.I am so busy in the morning every little thing helps! I know I know, "they" say to not skip breakfast, but I'm NOT hungry AT ALL when I get up. I just do not want anything for hours. So I just bring some fruit and yogurt with me when I go, so I can eat it when I do get hungry. I pack anything I might need, eliminate distractions and consume carbs and tea. I hardly ever have a busy morning but when I do I take out my clothes the night before. I prepare the night before by getting clothes ready and lunch for the next day. I even boil eggs for breakfast. Easy to grab and eat when on the go. I keep quick and healthy breakfast foods available at home at all times. Bananas, granola, juices and things like that. I preparef the night before. I actually do not have any busy mornings on the go. I am at home all day and night. My days are just standard days that are boring. Being prepped the night before is the best way to be ready. I think the key to busy mornings is to plan ahead and prepare as much as possible during the night to make your mornings less hectic. I get everyone up when they need to be and out the door on time; i try to get us to sit and eat breakfast together. I start with coffee and a healthy breakfast. On busy mornings I usually give the kids cereal or breakfast burritos. I manage by keeping a routine! I grab a yogurt and run out the door. Hee hee.busy mornings,one step,one prayer,and one smile at a time. I prepare the night before and keep coffee readily available for the mornings. I grab granola bar and Greek yogurt on the go. I manage busy mornings on the go with planning the night before and lots of coffee. I try to get as much done the night before so there is less rush & less items forgotten. I manage busy mornings by preparing lunches and clothing the night before.